The case of an unarmed man who died in July after being held ina chokehold by a policeman is now nearing a decision by a New York City grand jury on whether the officer will face charges. 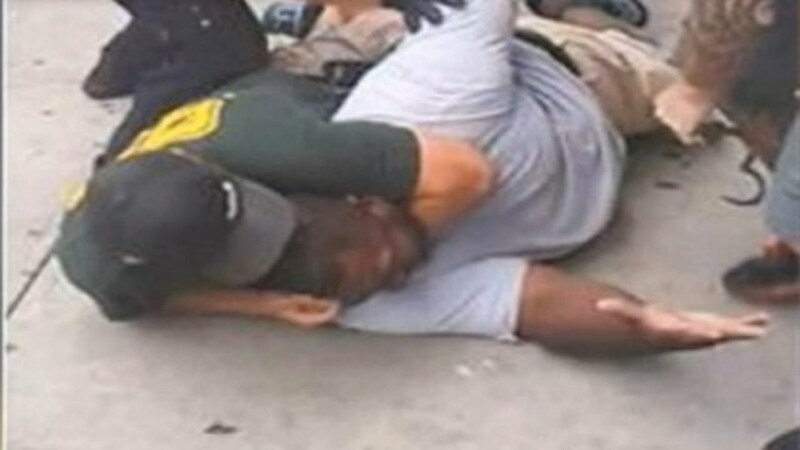 Eric Garner, 43, is seen in an amateur YouTube video being restrained by four police officers on 17 July 2014 before one, named Daniel Pantaleo, wraps his arm around the man’s neck in, what appears to be, a tight grip around his throat while the others handcuff him. He is clearly heard to say “I can’t breathe” while a plain-clothed policeman in a green T-shirt forcibly pushing the man’s head against the pavement on Staten Island, New York, and Garner is said to have died in police custody a few hours later although it is also believed he passed away at the scene within a few minutes. Police believe that Garner was selling single untaxed cigarettes out on the streets of Tompkinsville and apprehended him outside a beauty supply shop on Bay Street. According to police, Eric Garner was stopped after they had seen him selling untaxed cigarettesThe death was ruled as homicide on 4 August by a medical examiner. The day after the ruling, documenter Orta was charged with firearms possession soon after the footage gained global interest. However, he claims that police framed him in an act of revenge for filming the death of Garner, who is believed to be his friend. “I had nothing to do with this. I would be stupid to walk around with a gun after me being in the spotlight,” he added. NYPD Union leader Patrick Lynch challenged the claim that Pantaleo used a chokehold on Garner although it was confirmed by medical examiners on 1 August that chokehold and chest compression were the primary causes of his death and the 160kg-heavy man’s heart problems, obesity and asthma were additional factors. As a result of the chokehold, which is force prohibited by the NYPD since 1993, four medical workers who responded to the incident were suspended without pay on 21 July and Pantaleo was placed on desk duty, with his gun and badge taken away. The death of the married father-of-six is followed by the case ofMichael Brown, an unarmed 18-year-old black teenager shot dead by an officer on 9 August, which sparked protest across the world after policeman Darren Wilson was not charged for the shooting. The incident in Ferguson, Missouri, led to impassioned protests across the US as well as in London. US shoot-to-kill policy has continued to come under heavy criticism after 12-year-old Tamir Rice was also shot dead within seconds of a police officer noticing he was carrying a fake gun on 22 November this year.